Can a technology-rich program — designed to be developmentally appropriate for young children — not only promote the acquisition of important technology skills but also help children become better citizens and human beings? The growth of Science, Technology, Engineering and Math (STEM) education highlights the need for technical knowledge and skills but usually ignores the cultivation of character virtues. 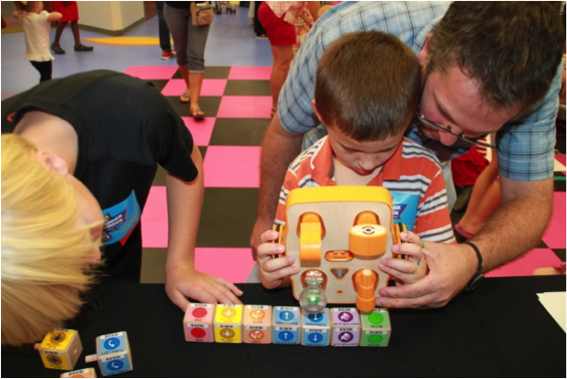 The Beyond STEM project — funded by the John Templeton Foundation — explores whether a robotics curriculum that makes coding and computer science developmentally appropriate for young children can not only educate students to fulfill the increasingly technically-sophisticated demands of the modern workforce by providing skills from computer science and engineering, but also help children become better citizens and human beings. The project will focus on three character virtues that Sir John Templeton considered crucial for purposeful living: curiosity, creativity and generosity. It will be conducted in faith-based and secular elementary schools in the United States and Argentina to help provide an understanding of the contribution of religious and cultural variables to the outcomes. Why teach coding and robotics? Today there is a strong global push to promote education in STEM subjects. As of the writing of this proposal, 16 countries in Europe and the Middle East have integrated coding into the curriculum at the national, regional, or local level, including Austria, Bulgaria, the Czech Republic, Denmark, Estonia, France, Hungary, Ireland, Israel, Lithuania, Malta, Spain, Poland, Portugal, Slovakia, and the UK (Balanskat & Engelhardt, 2015; European Schoolnet, 2014; Livingstone, 2012). Outside of Europe, countries such as Australia and Singapore have also established clear policies and frameworks for introducing technology and computer programming in K-12 education (Australian Curriculum & Assessment Authority, 2015; Digital News Asia, 2015; Siu and Lam, 2003). In Latin America, there has been an uptake in computer science education initiatives. In Mexico, a pilot computer science education week activity was introduced to students. Researchers found that the pilot was able to increase participation in computer science and generated interest in programming among students (Escherle et al., 2016). In Argentina, the One Laptop per Child program was able to show that laptop availability improved school readiness and learning outcomes in students (Goldin et al., 2014). In Uruguay, the government has an extensive program that gives children access to programming materials and offers technology curriculum (Hirsh-Pasek et al., 2015). In addition, the Ministry of Education in both Ecuador and Argentina has pledged to integrate computer programming into the curriculum and train teachers in computational thinking and programming (Code.org, 2017). When compared with other countries, the United States lags behind, with only one in four schools teaching computer science, and only 32 states allowing computer science courses to count towards high school graduation. Of those states, only seven currently have computer science curriculum standards in grades K-12 (Code.org, 2016). Regardless of the policies currently in place, over 182 million elementary, middle, and high school students across 198 countries completed the “Hour of Code” tutorials between 2013 and 2015 (Computer Science Education Week, 2016). In January of 2015, the Hour of Code reached 100 million “hours served,” making the Hour of Code the largest education campaign in history (Computer Science Education Week, 2016. This campaign shows the extent of the public’s need and demand for introducing computer science programs in education. According to Code.org, the nonprofit that encourages schools nationwide to adopt programming curricula and promote broad participation in computer science, 71% of all new jobs in STEM are in computing. However, only 8% of STEM graduates are in Computer Science. This discrepancy highlights the importance of starting early: the workforce needs coders. And this need is only growing: the U.S. Bureau of Labor Statistics predicts that employment of computer and information technology occupations will grow 12% from 2014 to 2024 (U.S. Bureau of Labor Statistics, 2016). This increase represents the fastest average for all occupations, projected to add about 488,500 new jobs in the 20-year span. Research and policy changes over the recent years have brought a newfound focus to the role of technology in early childhood (Sesame Workshop, 2009; Barron et al., 2011; International Society for Technology in Education (ISTE), 2007; NAEYC and Fred Rogers Center for Early Learning and Children’s Media, 2012; U.S. Department of Education, 2010; A framework for K-12 CS, https://k12cs.org/). Early childhood is an important time for young children to grow, play, and explore the world they live in. Research shows that from both an economic and developmental standpoint, educational interventions that begin in early childhood are associated with lower costs and more durable effects than interventions that begin later on (e.g., Cunha & Heckman, 2007; Heckman & Masterov, 2004). Two National Research Council reports—Eager to Learn (2001) and From Neurons to Neighborhoods (2002)—document the significance of early experiences. Thus, this proposed project focuses on early childhood, most specifically, children in kindergarten (aged 4 to 6 years). Developmentally, this stage in life is characterized by genuine curiosity and desire for learning. In order for young children to master new knowledge about the world, they need hands-on experiences (Piaget, 1936). By building on their natural inclination to design and build things, and to take things apart to see how they work, it is possible to introduce powerful concepts and skills in computer science, engineering and robotics (Petroski, 2003). New technologies, such as educational robotics, offer children a hands-on way to learn about the “smart” objects they encounter every day. What is unique to our human-made world today is the fusion of electronics with mechanical structures to make these “smart objects”. We go to the bathroom to wash our hands, and the faucets “know” when to start dispensing water. The elevator “knows” when someone’s little hands are in between the doors and shouldn’t close. Our cell phones “know” how to take pictures, send emails, and behave as alarm clocks. Even our cars “know” where we want to go and can take us there without getting lost (Bers, 2008a; Bers & Horn, 2010). We live in a world in which bits and atoms are increasingly integrated (Gershenfeld, 2000). Thus, the growth of educational robotics (Resnick, 2006). Most specifically, robotics is an ideal tool for early childhood education because it facilitates cognitive as well as fine motor and social development (Bers, 2008c; Clements, 1999; Lee, Sullivan, & Bers, 2013; Svensson, 2000). It engages children creatively, as an expressive medium, while developing technical skills and a curious mindset (Bers, 2008a). Unlike many apps and computer games, robotics activities do not involve sitting alone in front of a screen, but do facilitate active movement, team work, collaboration and creative problem solving (Sullivan & Bers, 2015). Previous studies show that children as young as four years old can learn foundational computational thinking concepts (Bers, 2018; Bers, 2008c) and this kind of learning can support their literacy, mathematical, and social and emotional socio-emotional development (Kazakoff & Bers, 2012; Kazakoff, Sullivan, & Bers, 2013). 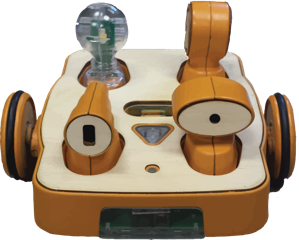 As Bers has shown (2018), when computational thinking is developed in the context of programming robots with a playful approach, it becomes developmentally appropriate for early childhood education. Research shows that introducing this work in early childhood might help to avoid stereotypes and other impediments to entering the innovation pipeline later on. This benefit is even more important when trying to involve minorities, females and underrepresented groups in the technical fields (Madill, Campbell, Dallas, et al., 2007; Markert, 1996). However, learning to code does not just expand a child’s career options in the future. Through coding, young children learn to comprehend and manipulate the digital landscape in which they live by thinking through “powerful ideas,” a concept coined by Seymour Papert, as fundamental in his theory of Constructionism (Papert, 1980). Constructionism proposes that technologies (including computers as well as tangible manipulatives such as robotics) are powerful for educational purposes when used to support the design, construction and programming of personally and epistemologically meaningful projects (Papert, 1980). When programming, children work through powerful ideas of computer science and engineering, and engage in self-expression. Children explore how to communicate through a range of new media, how to test and refine designs, and learn to problem-solve using multiple strategies. Studies have shown that the process of designing and debugging computer programs also engages children in metacognitive activities (Clements & Sarama, 1992; Battista & Clements, 1986; Clements, 1987). Constructionism recognized early on that designing, building and problem-solving can happen beyond the computer screen. Inspired by her mentor Seymour Papert, Prof Marina Umaschi Bers at Tufts University is leading the effort both nationally and internationally of developing early childhood programs that utilize robotics as a pedagogical tool to integrate STEM into a curriculum that promotes positive youth development (Bers, 2012; Bers, 2018). This robotics program has been successfully piloted with over thousands of children and teachers in the U.S., Europe, South America, Singapore and beyond (see a list of publications on the DevTech website: http://ase.tufts.edu/DevTech/publications/ and see pictures and videos of projects here: http://tkroboticsnetwork.ning.com). The program consists of pedagogical and technical tools, curriculum and professional development strategies for teachers, workshops as well as outreach activities to support community engagement to promote scalability and sustainability. The proposed project will extend this program and adapt it to explicitly focus on whether it can be used to promote character virtues in kindergarten students. Most specifically, the project will explore the different ways in which a robotics program can promote three character virtues proposed by Sir John Templeton as crucial for purposeful living (curiosity, creativity and generosity), in different geographical settings (U.S. and Argentina) within religious and secular schools. Character Education in Early Childhood: Why focus on character virtues? Although character development is a fundamental aspect of early childhood education, there has been scarce consensus on the subject (Berkowitz & Bier, 2007, 2014). Some studies have looked at the role of emotions, such as “sympathy for others,” in character and moral development (Arsenio, 2014; Daniel et al., 2014). Other researchers have investigated the link between character education in early childhood and academic success. Benninga, (2014) looked at hundreds of elementary schools in California that were scored for their character education implementation. The researchers found that schools with greater character education implementation had higher academic scores. However, more work needs to be done to understand effective ways to implement educational programs that can bring about change in character development. Lawrence Kohlberg, (1976) extended Piaget’s work in the domain of moral education. Although Kohlberg was most well-known for his psychological stages of moral development, he also proposed the Just Community model of moral education which brings equality, values, and justice to students and educators (Kohlberg, 1985; Reed, 1997). Kohlberg understood moral development to be the result of an increasing ability to perceive and integrate social experience through taking diverse roles and encountering different perspectives within a group. This approach proposes that involvement in social institutions, in which there is group decision-making and self-government, is critical in shaping the individual’s moral development. Although the assumption behind this approach, as well as that of Piaget, is that there is a universal progression from a concrete to an abstract way of thinking about moral issues (Gilligan, 1982; Papert, 1987; Turkle & Papert, 1992), it provides the foundation for developing educational programs that place the individual child’s learning in context. Thus, the choice for the proposed project of working within a context that has traditionally focused on promoting character development and a moral compass: religious educational institutions. In that context, we can observe the moral lives of children (Coles, 1986) rather than only their moral thinking. Through the proposed robotics program, children and teachers will engage in a learning environment that promotes character values in the context of a learning community in which virtues are not only a matter of analysis and reflection, but also of everyday action and behavior (Kohlberg, 1985; Hickey & Scharf, 1980). This approach is consistent with the theoretical and pedagogical framework upon which the robotics program is designed: Positive Technological Development (PTD) (Bers, 2012, 2018). PTD describes and identifies positive behaviors that can be facilitated through the use of technology by using the language of the 6C’s: communication, collaboration, community-building, content creation, creativity, and choices of conduct. Some of these 6 Cs support behaviors that enrich the intrapersonal domain (content creation, creativity, and choices of conduct); others address the interpersonal domain and look at social aspects (communication, collaboration, and community building). These behaviors facilitated by technology are associated with personal assets that have been described by decades of research on positive youth development (PYD) looking at the dynamic relations between individuals and contexts needed for thriving in life (Lerner, Lerner, Bowers, & Geldhof, 2015; Lerner, Almerigi, Theokas, & Lerner, 2005). PYD researchers also use a “Cs” labeling model, in this case, six Cs that refer to developmental assets: competence (cognitive abilities and behavioral dispositions for being healthy), connection (positive bonds with people and institutions), character (integrity and moral centeredness), confidence (positive self-regard, a sense of self-efficacy), caring (human values, empathy, and a sense of social justice), and contribution (orientation to contribute to civil society) (Lerner, 2002; Lerner et al., 2005). Lerner et al. (2015) show that when five of the Cs are present (competence, confidence, caring, connection, and character) it leads to the sixth C of contribution. Taken together, these six characteristics reflect a growing consensus about what is involved in healthy and positive development among people in the first two decades of their lives and the promotion of healthy communities (Scales, Benson, Leffert, & Blyth, 2000). Figure 1 shows the PTD theoretical framework composed of 12 Cs: 6 assets derived from PYD, and 6 behaviors from PTD. The PTD framework provides a model for how development can be supported through the use of new technologies (Bers, 2012), as well as guidelines for curriculum development and program evaluation (Sullivan & Bers, 2017). As a theoretical approach, PTD grew from integrating Papert’s Constructionism (Bers, 2008c; Papert, 1980) with applied developmental science, most specifically Positive Youth Development (PYD) (Benson, Scales, Hamilton, & Sesma, 2006; Damon, 2004). The use of the term positive in both PYD and PTD connotes the goal of engaging a young person in a good, healthy, and productive developmental trajectory (i.e., development toward improvement of one’s self and society). While PYD explains positive behavior, it does not take an interventionist perspective. PTD brings design into the discussion and focuses on design of technologies and educational programs as tools to promote change. PYD describes a naturally occurring phenomenon (i.e. positive development), while PTD provides methods and tools for designing experiences where positive development is more likely to happen. Most specifically, the proposed project will explore how the different positive behaviors (6 Cs proposed by the PTD framework) promoted through the robotics program engage children in the development of the three character virtues of interest: generosity, creativity and curiosity.